After undergoing so much deprivation and distresses, pains and agony across the deserts to the coasts of North Africa, a massive number of the sub -Saharan Africa have died in a bid to cross the Atlantic ocean to Europe. But what makes this atrocity so horrendous is the oblivious nature of the crime.... The outrageous indifference of our leaders and the contempt they impress upon the lives of the people.... The indignity of dying in such a hopeless condition is so scandalous. I am angry against the resigned complacency we Africans display.. I am angry because Africa has had enough of this brutal dictator- thugs. Enough of the glaring cruelty of our corrupt elites whose only aim is to embezzle the entire countries public treasury. Famously corrupt they spend much of their life time in office amassing impressive personal fortune from stealing public funds, on a scale that is unthinkable; they are never bordered to come up with a form of development plan to sooth the suffering masses or try to lead their countries to a modern age; Instead, with their families, they lead a lavish life style, owning fleets of mercedes limos, private jets, embarking on a shopping spree in foreign countries and owning numerous palaces while many people in that country are consigned to sulphurous misery and pain, as some people starve to death. Am angry because our leaders are comfortable in the face of all the social, cultural, economic malfunction they generated, am angry because they are not held accountable even as they wreck havoc on the lives of the people. And through it all, African media journalism is not playing its role, "journalism is the voice of the voiceless" its purpose is to serve the people by ensuring the best for the citizens; and conveying information that will promote dialogue that will bring a change. 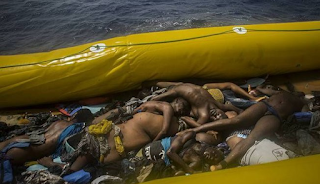 It is an unimaginable abberation of the media that underestimated number of 6000 Africans die every year from drowning in the Atlantic in their flight to Europe and voices are not raised at all... .As if such a critical devastation of lives is not considered crucial enough to make headlines. Continental tragedy that has reached an epidemic proportion and yet not as news worthy of the press; it is a pervasive trend across the states of Africa today. And It is the role of a responsible media system and the journalists to shed light on the disaster and inform their community, their elites and their leaders (churches, Ngo,s and civil society, etc. ), that a dreadful trend is sucking up the youths in the sub-Saharan Africa. Unfortunately, as it appears, nobody cares "whereas we are facing the greatest neglected humanitarian tragedy in the history of mankind after the slave holocaust"says one social blogger. So many of their ordeals and afflictions have regularly hit the headlines in the Euro press for a long time now. Then again thousands of Africans lives have for that long been feeding the fishes of the Atlantic oceans and yet not a quip of condemnation or protest from or out of African against their governments. The governance of most Africans countries is utterly negligent about their people and their welfare. What truly is unforgivable is this pervasive contempt and neglect for the dignity, African lives. "Our irresponsible and abusive leaders have been incapable to inform a system of social solidarity, and the word "empathy" is a meaningless concept among our leaders, "said one political blogger Not one African state has attempted efforts to restrain the flow of immigrants; African leadership is unapologetically care less about the people's welfare and have no plans to attempt to secure their lives. They are undaunted even by the extensive loss of lives;the carelessness and indignity of their deaths, the unspeakable misery they have endured. What sounds more utterly outrageous is this notion that family members may never know the fate of their siblings who's been drowned. How sad to think about the anguish and the loneliness of a waiting mum... "I suffered years of lonely sleepless nights waiting to get a call from France or Germany... A call or the voice of my son Lamine that voice... That call that will never come"... Until seven years later when one of his friends came to visit me with medal gold chain belonging to my son Lamine ,which was given to him as a pledge for a loan that was relevant to their journey... He then said to me how their boat for the crossing to Italy got punctured and out of the 75 people drowned, he was one of the 15 survivors that was rescued by a fishing boat" narrated a heart broken Miriama Dramé mother of Lamine... And he is just one out of the thousands of victims who have died in the attempted perilous journey to the coast of Italy. There are Thousands of families, like Lamine's mum left behind.. waiting in vain for a miracle that will never happen or for that song that will never return. This is a story of hopelessness and despair magnified in a thousand fold told and endured by families who are bearing the unbearable. Poor Africans!,whose unique choice of life is today between the rope around their neck or going to die in the sea to avoid shame. Yet the plight of these people has never had a front page in the news media of Africa, yet their is never any known African organization or charity movement participating actively in a bid to put an end to the catastrophy, to save lives on the sea. Why are African lives so valueless and so meaningless? There is a great deficit of value for humanity and humanism in this land of desolation and human tragedy. African is suffering not only from themselves but also from the ineptitude of their leaders, five decades after independence and the creation of the AO, Africa remains unable to fit into any form of dynamic strategy in relation to progress, to development and to prosperity. The vision of the AO to build an integrated African prosperity in peace led by its citizens constituting a dynamic force in the world scene, fighting against poverty, environmental security, and development, has remained virtually a fleeting illusion.Instead what we are witnessing is a leadership that is seemingly less and less interested in the collective welfare. A leadership that is more inclined to self enrichment and self absorption, petty squabbling of enlarged egos among egoistical oligarchs with mammoth indifference to economic rules, treating the resources and wealth of their nation as spoils of war. Corruption is a very serious threat in the African societies and we are experiencing the detrimental effect of it. It is a threat to prosperity, and stability; a threat to democracy, economic and social well being of the African societies. The result of a perverse economic incentive is a catastrophic social disintegration of our societies, despite the trade in Oils, the gas, the metal copper, gold, coltan deposits which attracts a global network of traders, Africa remained tethered to the bottom of the industrial supply chain. What is happening in Africa is a systematic looting of our resources. Africa accounts for 30%of world's reserves of hydrocarbon and minerals, it has 15%of the world population, but its share of global manufacturing is no more than 1% so what do we expect ? We as Africans have created our unfortunate situation through our inability to be responsible. We know the challenges we face and we know the priorities, but why is it that the urgent matters of now that have made priorities for the world leaders has never been a preoccupation for the African leadership. World leaders seek to relate to their people on issues that upset the world stability, such as the climate change, poverty, education, new technology etc., as they seek solutions to the problems. They pursue prospective goals that will be protecting and ensuring the best for the people, particularly at a moment when the rights and opportunities of the powerless and the voiceless are at stake, they make policies- to promote a kind of society they want their own children to thrive in. They set the goal of promoting a general welfare for the people, Dubai was a desert built from nothing, in less than 15 years. The primary goal of a responsible government is the social welfare of its people. African leaders have one priority.. Eliminating all political opposition from day one like Robert Mugabe did , the next step is to enleash a reign of terror and corruption. Totally indifferent to common priorities on the world agenda like giving the youth the necessary education and securing the key to economic opportunity, providing social security for the people... They will rather splurge fancy cars and Stach millions of dollars away in foreign banks or even in their bedrooms while all around is a glaring abject poverty and squalor.Our nations are purged of talents, as they strangle the economic propectives through corruption negligence and pure inertia. It is time to place the blame where it belongs. Some critics suggest Europe has a blame for closing its borders. The real tragedy is not that the borders were closed or not. The auto-expulsion or exodus of African youth from their homeland was triggered from the widespread frustration of people under an atmosphere of suffocating misery, violence, and oppression; squalor disease destitution and overcrowding. Conditions that make impossible the ease of life The real tragedy is that this did not have to happen at all and not because the euro Borders were closed. The real tragedy is that thousands of Africans are roaming the deserts today in a dispeakable condition and go on to cross the oceans at once, the nomads of the first ages of humanity in search of a better living condition. Yesterday the slave master emptied Africa, today Africa is emptying itself. Yet again over seventy thousand souls are still stuck in the mud of the Libyan impasse with nobody coming to their rescue. Barely elected a few months ago the French President has proven to the African leadership how important human lives should be treated. Immediately after his inception, he convened a mini summit of the African leaders to find a solution to the crises, a process that should have been initiated by the leadership in Africa. European authorities and Europeans citizens all the while have been proactive in multiplying measures that could save lives and stem the scourge of death of the African youth fleeing war, famines and epidemics. And then attempting the perilous crossing of oceans to EU, Africans and their leaders and notably OAU now named AO have remained outrageously indifferent to a horrible tragedy that is affecting their own people and been raising an international outcry across the world. Is the sordid spectacle of waves of Africans roaming the deserts and forests of North Africa as undesirables refugees, and the undocumented immigrants not disgraceful enough? The British historian John IIife have refocused on the singularity of this African suffering which he qualified as the most wretched continent- under the light of its political, social and economic realities. For centuries we have been enslaved and sold colonized and exploited. Today we are despised and debased and abandoned by the people whom we elected. Abandoned to deprivation of life, of our voices, of our rights, our private freedom and even our dignity. The terrible tragedies that occur to the migrants show that we are the only continent that sustains as much tragic fate, as much cruelty and barbarism fueled by the madness of political traitors but voices are never raised from any angle inside or outside the continent. Centuries of over-exertion exerted on the life of people disfigured and defeated have rendered us to a humiliating capitulation. What general conclusion can we draw from this sordid tale; we intend to argue that Africa has never had a good governance, but that Africans are responsible to their misfortune. We are speaking against the prolonged tyranny of a block-headed regime across the states of Africa--- Against the unwillingness or the inability of its leaders to rise to the responsibility of true leadership. No continent has undergone such a litany of regimes of despots and tyrants for so long. Dos Santos of Angola was in power for 35 years and handed the economic power of the state to her daughter, Omar Bongo of Gabon was in power for 40 years and handed power to his own son, Eyadema of Togo ruled for 37years and like the Gabons president transferred power to his own son Faure Gnassimbé. Robert Mugabe 94 has been ruling the Zims for 30 years;Equatorial Guinea' President Theodore Obiang 75 has been in power for 38 years; Paul Biya of Cameroun 84, has been ruling the country since 1982 that amounts to 35 years; Sassou Ngueso of Congo Braza also has held office for over 32 years and has recently won the presidential race for another mandate of 7 years; Yowerri Museveni 73, of Uganda has spent over 30 years. Many more had exercised power for more than 25 years in the past and the present all spent much of their mandate looting, plundering and embezzling their national financial and economic resources with maximum impunity and total absence of accountability. Africa looks like a cursed continent whose political setup is so caricatural and make us look ridiculous in comparism with others Underscoring the evidence ignorance and very low political consciousness. While political and elite families and are choking to death on caviar and champagne, infrastructure and public services have virtually collapsed the nation's roads the schools and hospitals are weathering away. The human cost as a result of this dereliction of the political duty is unspeakable, as thousands have died in our hospitals; on the roads, many more have died in their flight for a better living condition. And the atmosphere is a permanent condition of anguish, desolation and destitution. I believe it is time for Outrage a time to express our concern about half a century of reckless and irresponsible leadership and their lack of desire to be competent. We cannot continue to accept the discomfort of this nightmare and we in numbers can make a real change. We cannot change our world, we cannot claim the promise of hope, until we change the people we send to represent us. Thus we must engage ourselves spiritually morally and physically to fight to impose men with integrity. We need someone who is compassionate, someone who is unifying someone who has the résilienc the grace and the integrity to stand with us to fight for us and to die for us if need be.